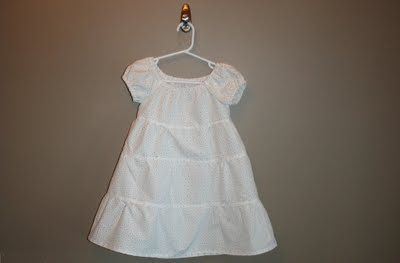 My entry for the blog/sew-a-long challenge is an Easter Dress for my little girl. Unfortunately, she hates it! She loves all things girly, all things homemade and dresses, so I have high hopes that she will like it by Easter. If not, I have a pretty little dress to enjoy in the closet! I fell in love with this fabric approximately 5 years ago. 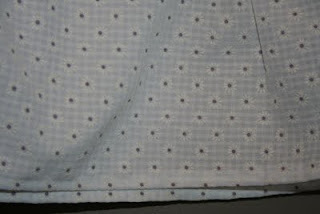 I did not sew very often at the time, but I was in the fabric store and saw it and had to have it. I was not sure what to do with it at first, so I spent some time looking through the pattern books. I finally found Simplicity 5695. I bought both the fabric and the pattern. Remember I mentioned that I did not sew very often 5 years ago, that meant I was a little nervous to actually make the dress. It sat in my closet until 3 days ago when I finally cut into it! I am blessed enough to have had two daughters, so even though my first daughter missed out, my second daughter might get to enjoy it. Here it is. Now, I just have to hope my daughter will wear it. UPDATE:﻿ My daughter will wear the dress!!! I added some pretty purple ribbon and a bow and she likes it. It is very pretty.